Very Good. 028943585729 Item in very good condition and ready to ship-Guaranteed to play! ! Fair. Discs have light scratches. Clean case/insert. No liner notes booklet. Wolfgang Amadeus Mozart. Fine. In fine packaging. 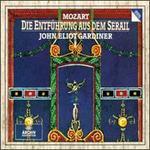 Mozart: Abduction from the Seraglio /DIE ENTFUHRUNG AUS DEM SERAIL /GARDINER. New. 1992. Audio CDs. Still in original plastic/shrink-wrap. Mozart-Die EntfÃÆ'Â¼hrung aus dem Serail / Orgonasova, Sieden, Olsen, Peper, Hauptmann, Minetti; Gardiner Orders will be mailed either on the day ordered or the next business day. Expedited shipping available. Like New. 2 CDs and includes booklet.